If some of you are holding off installing solar panels because you're concerned about the cost, then worry no more! Experts at McKinsey (a global management consulting firm, for those of you who don't know) believe the cost of solar power systems will come down drastically over the next few years. Its latest report entitled Solar power: Darkest before dawn – which sounds more like the title of a Star Wars film if you ask me – suggests that as manufacturing capacity doubles, underlying costs will fall. On a commercial scale, it anticipates a 40 per cent decline by 2014, followed by an additional 30 per cent by 2020. Although McKinsey expects solar power subsidies to start drying up over the coming years, growth will still take place in residential areas with moderate to good sun conditions. From a manufacturer's point of view, the report emphasises the need to continue to innovate and teach us consumers about the benefits of solar power. In case the message still hasn't gotten through, these are: reducing electricity bills, giving the environment a helping hand and protecting against price rises. 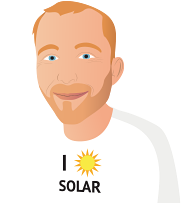 Although there may be some advantages to waiting it out before installing solar panels, these are of course only predictions…biding your time might not be worth it!